If you have a damaged oil pan outlet on your vehicle, the ABN Metric Oil Pan Drain Plug Thread Rethreading 114-Piece Tool Set - Rethreader Tap Kit Motorcycle Car Threading is your best choice for quick and easy repair. This comprehensive kit repairs automotive sump or gearbox and differential drain plug threads and is easy to use. Simply tap the damaged thread slightly oversized and then fit with the included drain plugs and washers. It is suitable for most threads on cars and light commercial vehicles. The taps are constructed from high-speed steel (HSS) and the washers are constructed from copper for maximum strength. 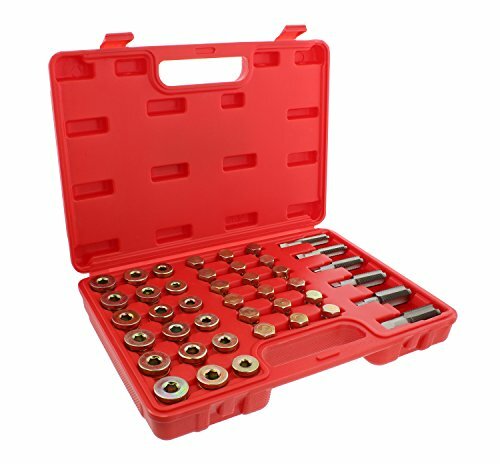 This package includes 6 taps, 36 oil drain plugs, and 72 washers packed inside a heavy-duty plastic blow-molded carrying case for your convenience.